Workout program for women never gets better than circuit training for getting fit bringing back the words tone your body into you fitness routine for real. Get fit fast doing circuit training for women to tone your body with or without a gym membership with great tips to get the ball moving on exercise and how to build your own circuit training workout plan adding yet another great tool to slim down exercising your body the right way. In addition to having to worry about a pudgy belly, the need to tone your body slimming down areas like your upper arms and thighs never ends. For anyone willing to put the work in for getting fit, one way you can do just that is taking up Circuit Training for women. Not only do circuit workouts help you get fit fast effectively targeting hard to reach areas of the body through the synergy between anaerobic and aerobic exercise. If done right, you are in for a big change in your life and start moving on to better things. In this daily take on Slism, we introduce circuit training workout programs for women and body toning exercises to help you burn fat exercising while building muscular strength and stamina to reach new heights in physical condition. Circuit training is a hybrid exercise method combining strength, stamina and cardio training done in cycles to boost exercise efficiency workout out. By combining different types of anaerobic exercise (strength training) and aerobic exercise (whole body workout), circuit training allows you to train both not to mention burn more calories. For example, one way to circuit train is to spend 30 seconds doing strength training followed by another half a minute followed by aerobic exercise such as jumping jacks and such. The kick to circuit training is that there are no breaks between exercises. That means right after finishing up your training your arms on the weight you have to move directly into the aerobic exercise you are doing. Do this for 20-30 minutes minimum. That's circuit training. Switching you routine to circuit training along deciding on a time and period to exercise is not enough to start seeing results when you circuit train. Although there is no one size fits all exercise menu that you can do everyday attacking the condition of all parts of the body, it is never enough to say that targeting the right parts of your body is no less than key. Going to a fitness club or the gym ensures a balanced workout menu guides by the expert advice of a professional trainer. Gyms that emphasize circuit training into the fitness programs they provide or on the increase. 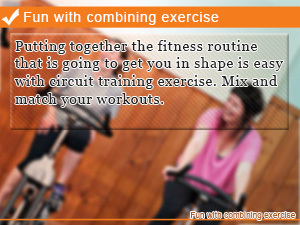 This makes for less time searching for the right exercise equipment to make your circuit training program work out. Even if you don't have pricey workout equipment available in your home that doesn't mean building you own circuit training program isn't something you should consider. Pick out 6-12 different types of exercises to get started. Use the following circuit training exercise plans as a reference when putting together your own plan. Note that unlike weight training, there is literally no time to rest. Try not to overexert yourself in the process. Unlike conventional weight training that works great if you are trying to put on muscle mass or build muscular strength isolating the part of your body you wish to train that doesn't help you build stamina; circuit training helps you combine strength training and cardio without piling on unnecessary fatigue. By switching between sections of your circuit training program after 30 to 60 seconds of continued exercise you greatly reduce how your workout affects your fatigue level that not only helps you build stamina but through the exchange of alternating between strength training and cardio helps you burn calories. As for circuit training programs you are used to see hanging up on the walls of your local gym, what you notice is that all they are is alternating between aerobic and anaerobic exercise. What's the deal with that? When you do aerobic exercise it is said that your body takes up to 20 minutes before you enter the fat burning zone. That doesn't mean that you can't mix in strength training in between. As long as you keep your heart rate up, it doesn't matter what type of exercise you do. Of course, getting in strength training into you routine without giving up on fat burning is unarguably and added plus that makes circuit training so popular amount fitness buffs and people breaking into exercise trying to lose weight. A good rule of thumb to have at your side when carrying out circuit training is that if you spend more than 30 seconds doing one thing, it may be time to start moving on to something else. The key to getting it right is staying active always knowing what's next with smooth transition. How often are do you work out in a week? Working out at least 5 times a week is more than enough cardio and strength training to reshape your body. There is no such thing as a man workout. That is to say it's time to start breaking the gender barriers in fitness starting with circuit training. Circuit training is the best of both worlds giving you the chance to touch up on your strengths while keeping your cardiovascular health solid. 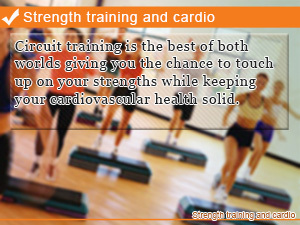 Putting together the fitness routine that is going to get you in shape is easy with circuit training exercise. Mix and match your workouts.